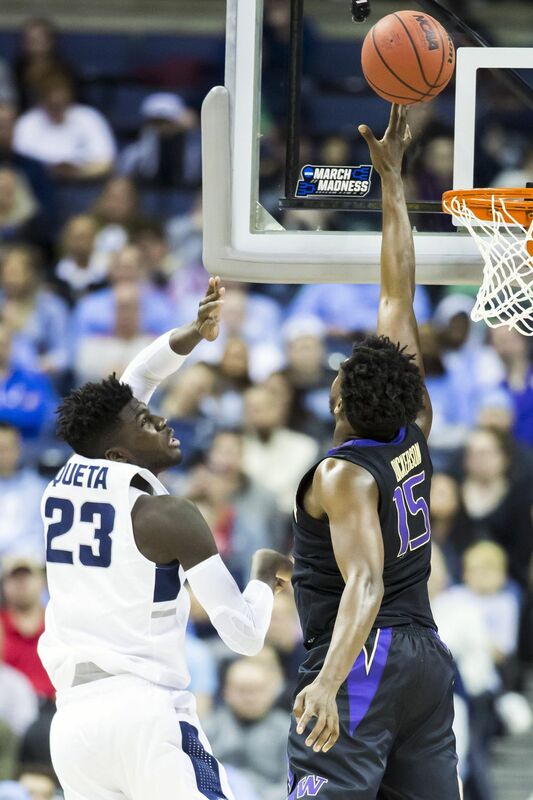 COLUMBUS, Ohio – Nahziah Carter sat at his locker stewing about missing a dunk on Utah State’s shot-blocking center Neemias Queta that surely would have made him a viral sensation on Day 2 of the NCAA tournament. 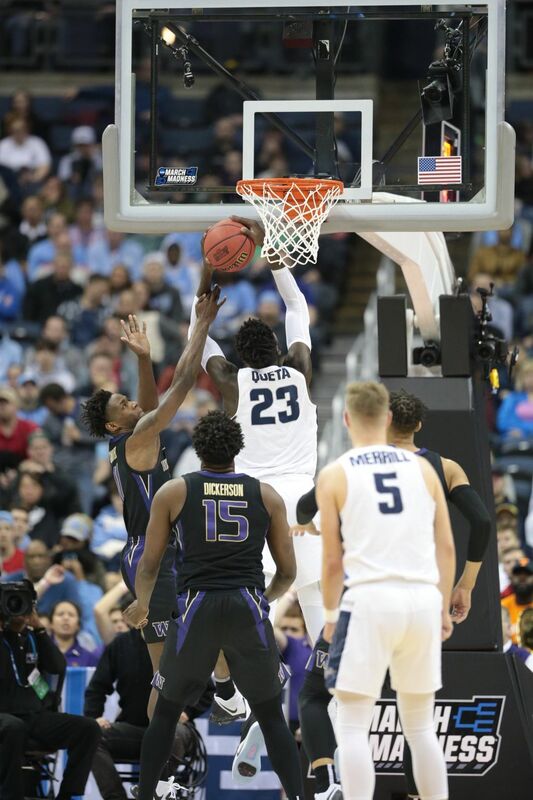 “Oooweee, I wanted that one,” the high-flying Husky said clapping his hands and smiling. “I think I got fouled, though. Carter came off the bench and delivered in the clutch for No. 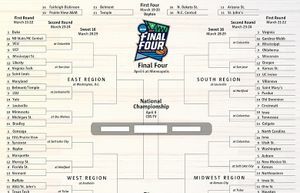 9 seed Washington, which overwhelmed No. 8 Utah State 78-61 with a surprisingly resurgent offensive performance and a suffocating defensive display. 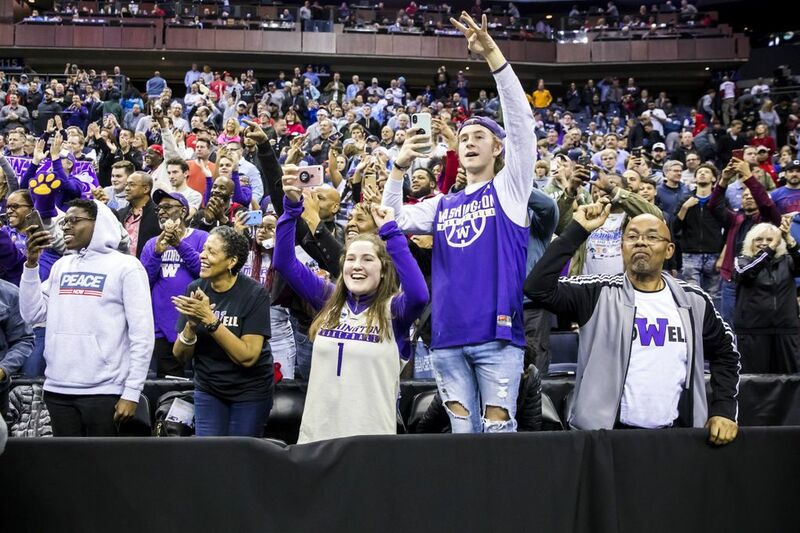 Washington will move on to face the top-seeded UNC Tar Heels on Sunday at 11:40 a.m. in the Round of 32 at Nationwide Arena. The game will be broadcast on CBS. 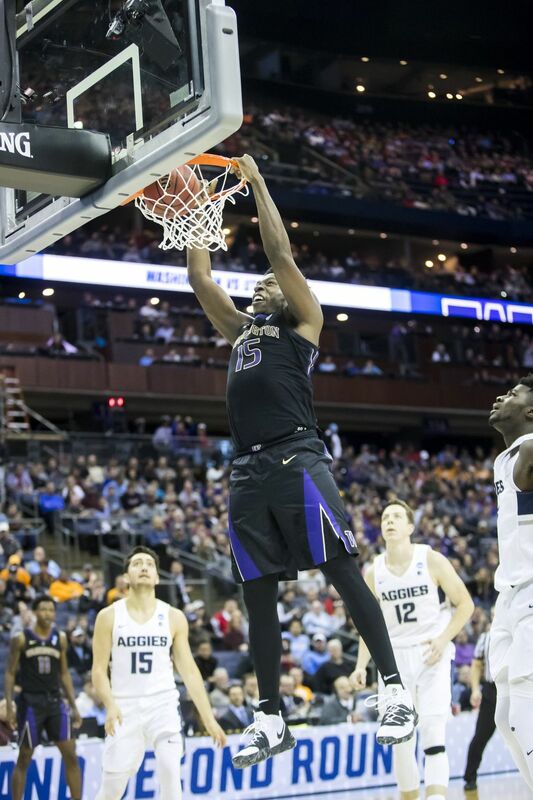 The Huskies (27-8) had too much of everything for the Aggies (28-7) of the Mountain West. Too much Noah Dickerson, who broke out of a three-game scoring slump to pound the Aggies inside with 20 points and 12 rebounds. 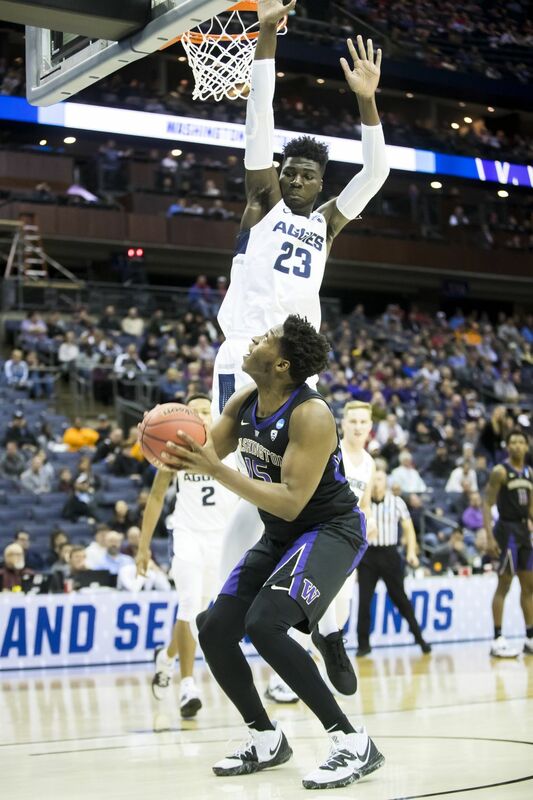 Too much Jaylen Nowell, who peppered Utah State with pinpoint shooting, including hitting 9 of 10 free throws, to finish with 19 points, five rebounds and five assists. 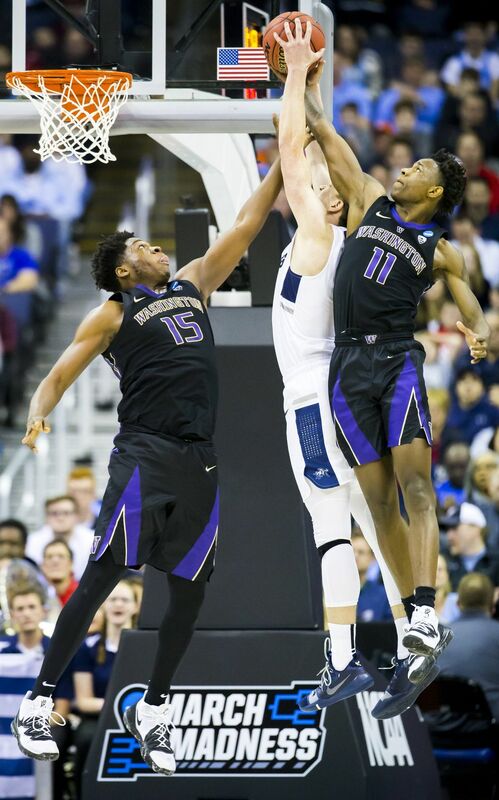 And too much Matisse Thybulle, who tallied 10 points, five steals, three blocks, three rebounds and two assists while leading UW’s stifling 2-3 zone defense that forced 21 turnovers. But the Huskies wouldn’t have been able to move on without Carter. 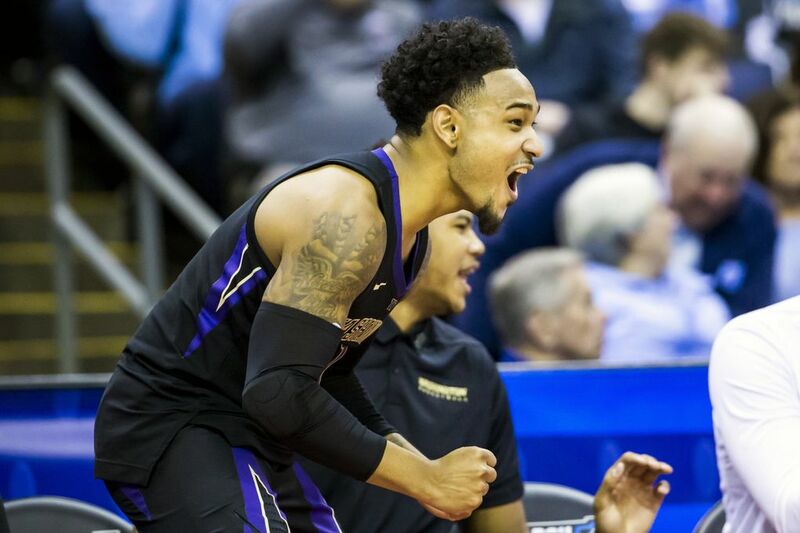 “He literally changed the game,” said UW guard David Crisp, who had eight points before fouling out with 8:16 left. “We went on a drought and a stretch where we couldn’t get nothing to go. Things were getting a little bit stagnant and he took over. 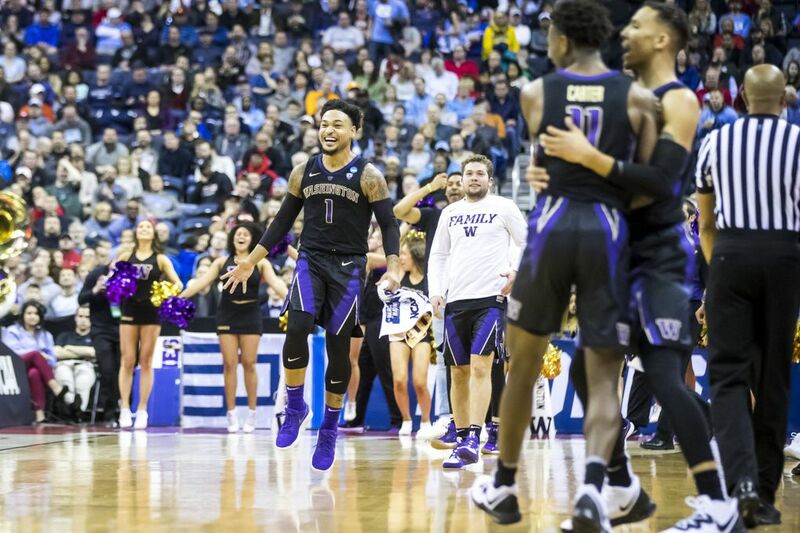 Before Carter’s late-game heroics, the Huskies trailed 17-16 midway through the first half and took control with a 24-11 run to take a 40-28 lead into halftime. Washington was up 48-35 when Utah State made one last comeback attempt and used an 18-6 spurt to nearly wipe away its 13-point deficit. 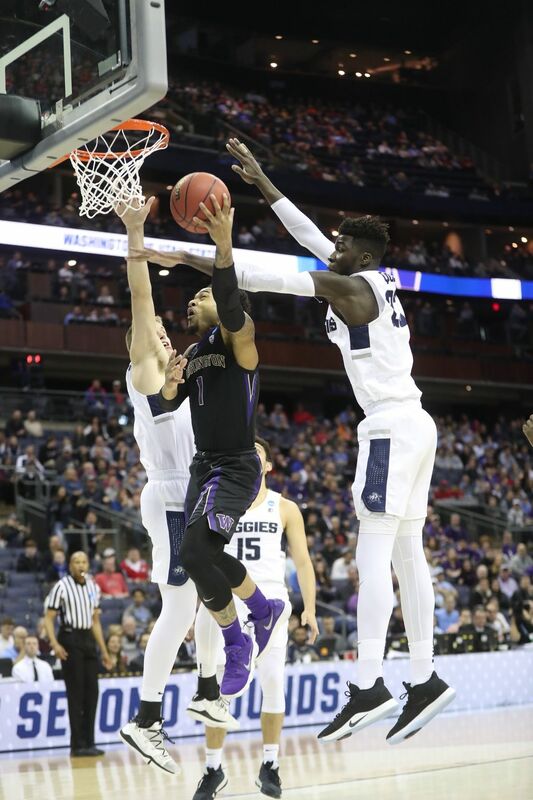 The Huskies held Utah State’s leading scoring Sam Merrill scoreless at halftime and handcuffed him for most of the game until the Aggies star drained a corner three-pointer to cut UW’s lead to 54-53 with 9:54 left. 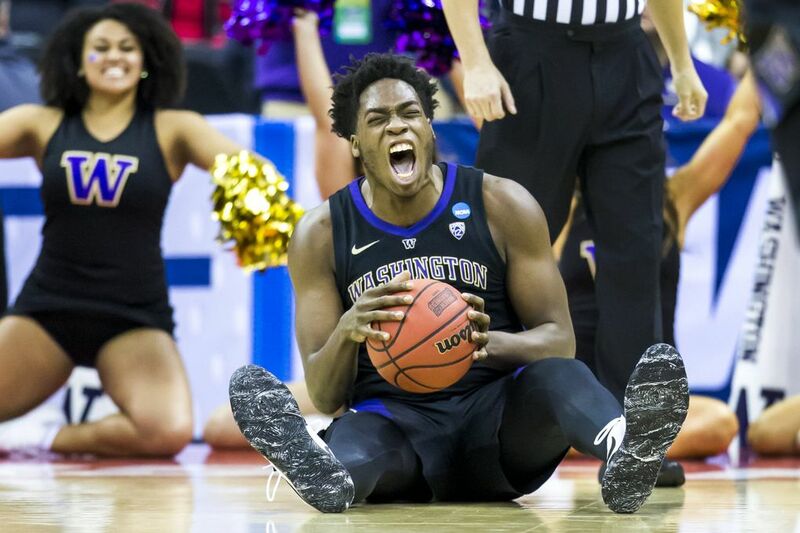 That’s when Carter came alive and triggered a dormant UW offense that closed the game on a 24-8 run. 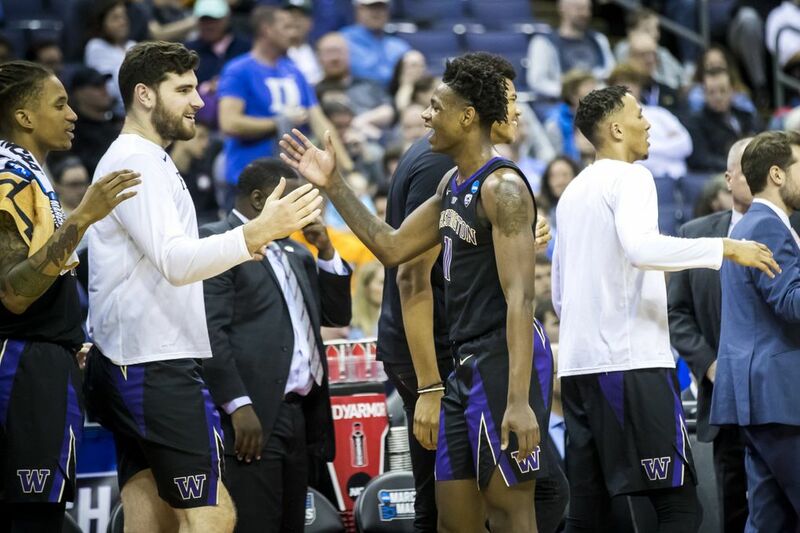 The sophomore guard converted or assisted on the next 11 points as UW regained control. 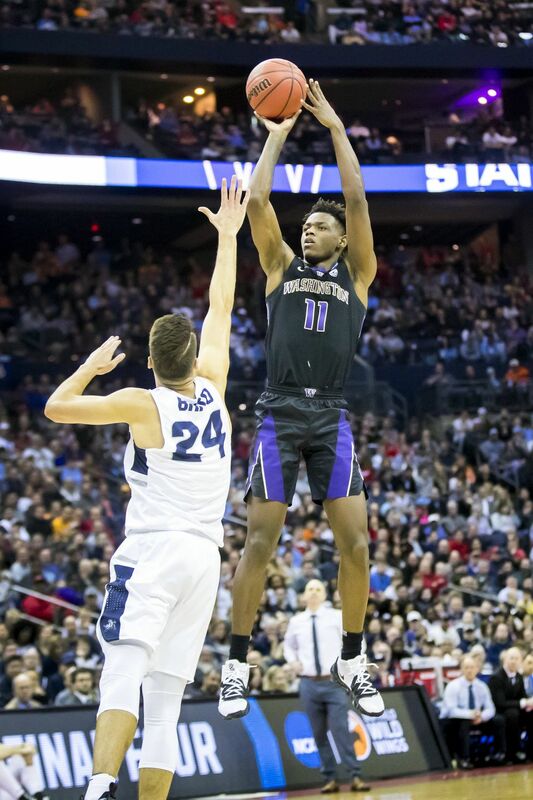 During a 3:45 spree, Carter drained back-to-back three-pointers, hit a free throw, found Dickerson beneath the rim for a dunk and converted a mid-range jumper. 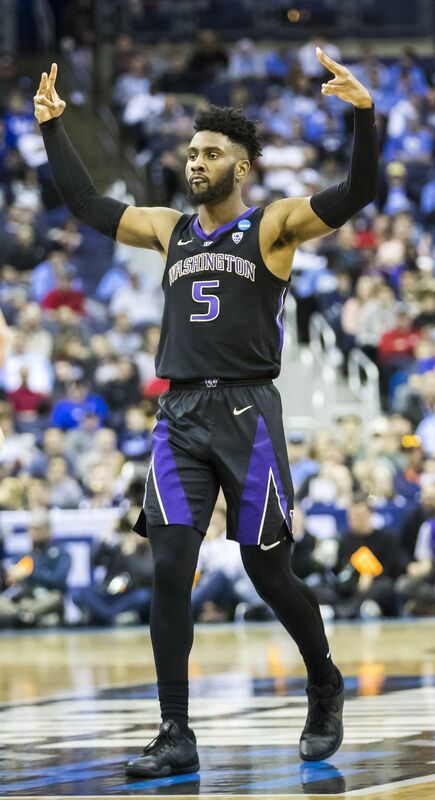 When he finished, Washington led 65-55 with 6:09 left and the game was essentially over. “He just went,” Nowell said. “He wasn’t scared of the moment. He really came out and was ready to play as hard as he could and it showed. 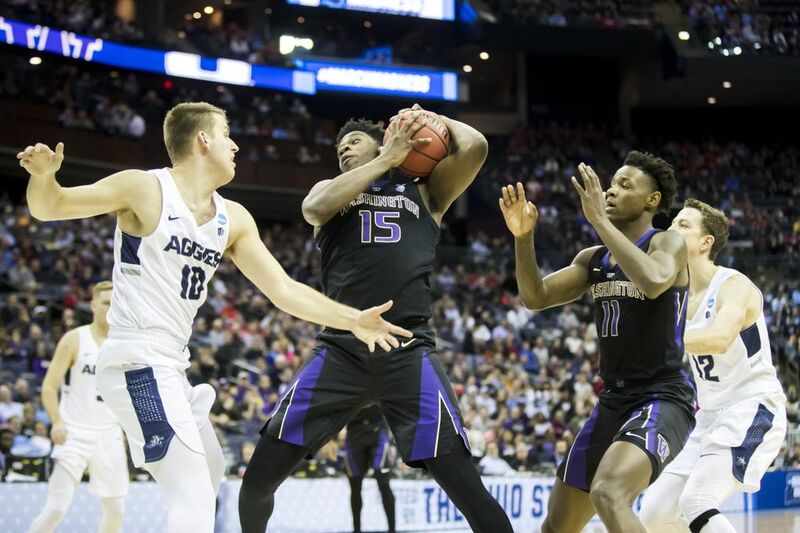 The Huskies led for 31:41 and dominated defensively while holding a prolific Aggies offense 18 points below its 79.1 scoring average. 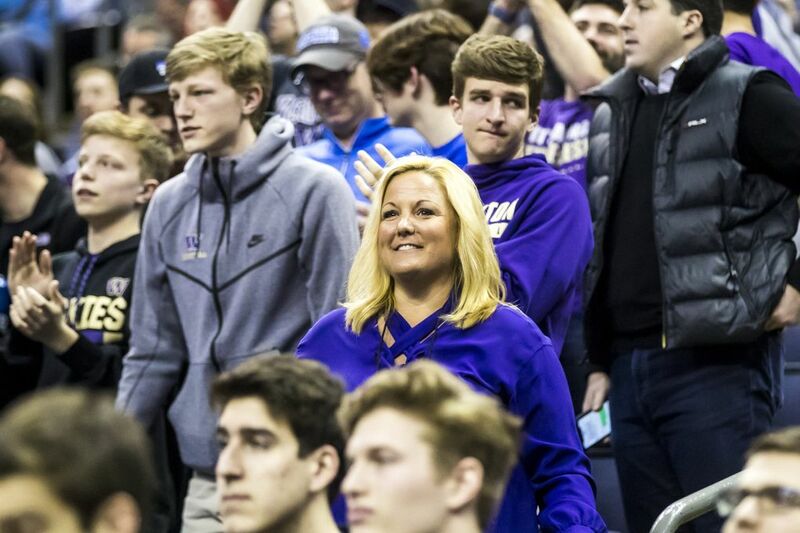 Case in point, Thybulle, the nation’s steals leader who averages 3.2 per game, swiped a Brock Miller pass at midcourt and raced ahead for a breakaway dunk to put Washington on top 34-25 with 3:58 left in the first half. 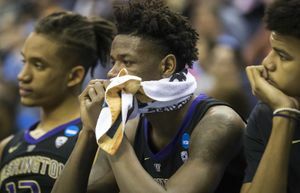 Thybulle also sensed trepidation and resignation among the Utah State players. 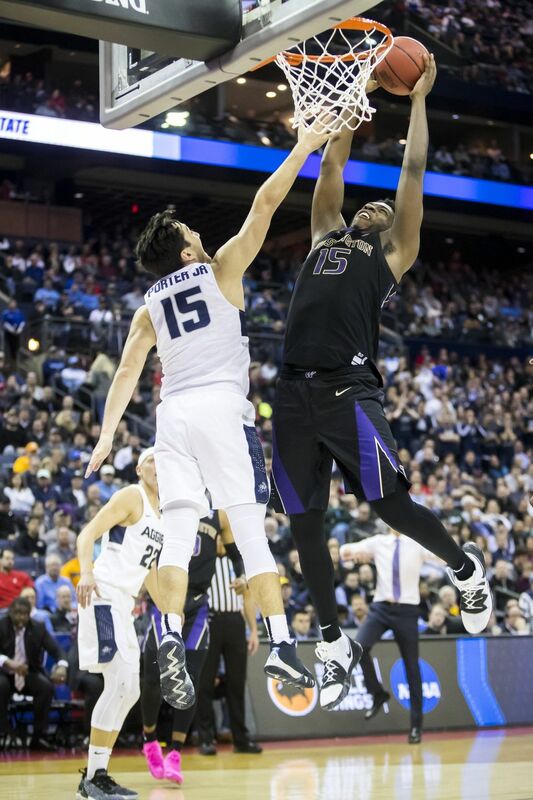 The Huskies targeted Merrill and held him to just 10 points — 11 fewer than his scoring average. Without their leading scorer, the Aggies were thrown off kilter and finished with their third-fewest points of the season. Miller finished with 13 points, Abel Porter 10 while Queta had 11 points and nine rebounds. 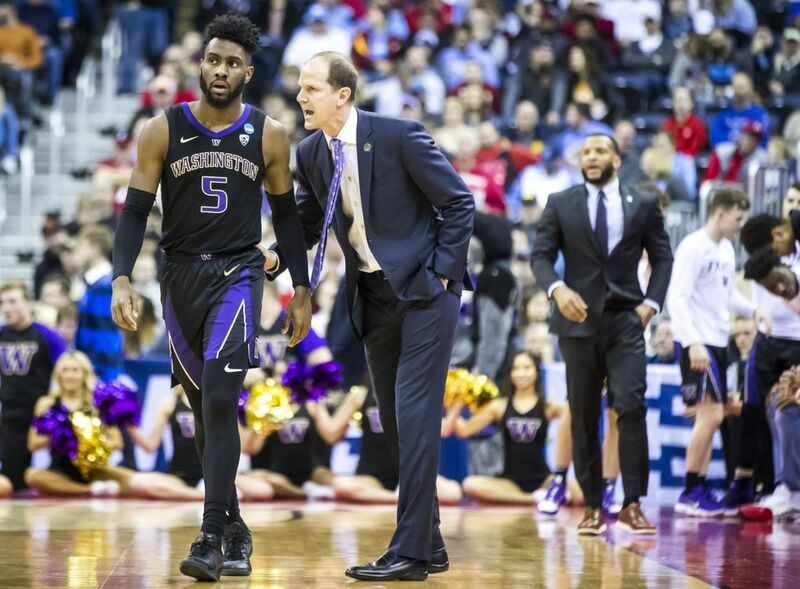 The Huskies heard all week about their inconsistent offense that managed a season-low 44 points in their last outing. 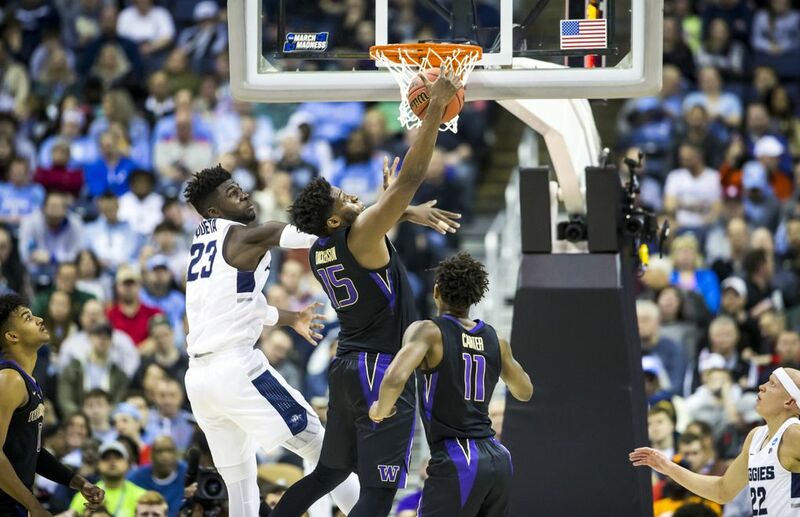 Against Utah State, Washington tied for its most points in regulation in the past two months while shooting 49 percent from the field, 58.8 percent on three-pointers (10 of 17) and converted 18 of 21 free throws. 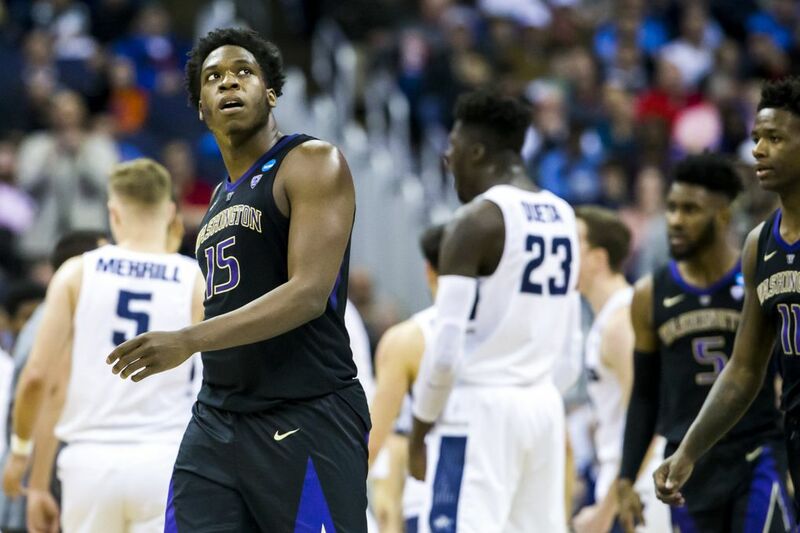 “We don’t worry about the offensive end,” Thybulle said. “We try to keep the ball moving. And we have our scout and we have areas that we’re trying to attack, but with our defense we’re able to stay in any game. 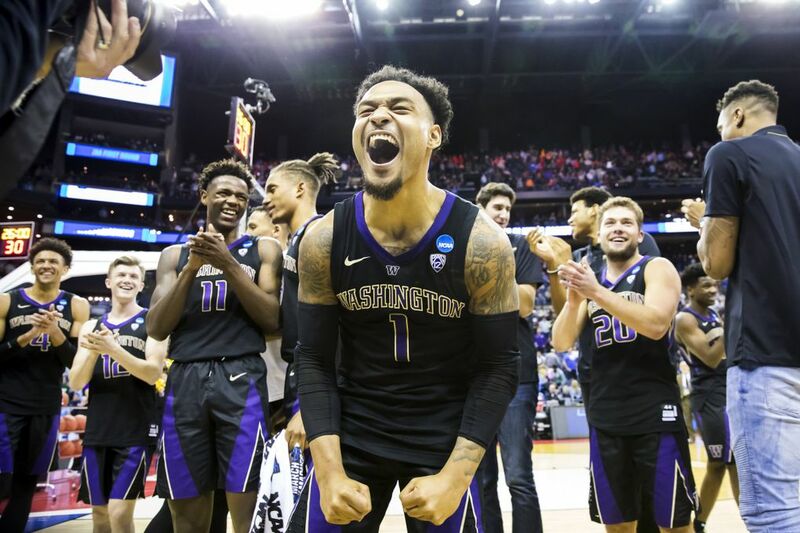 When it was over, the Huskies laughed and joked inside their locker room, but their attention quickly turned to Sunday’s game. 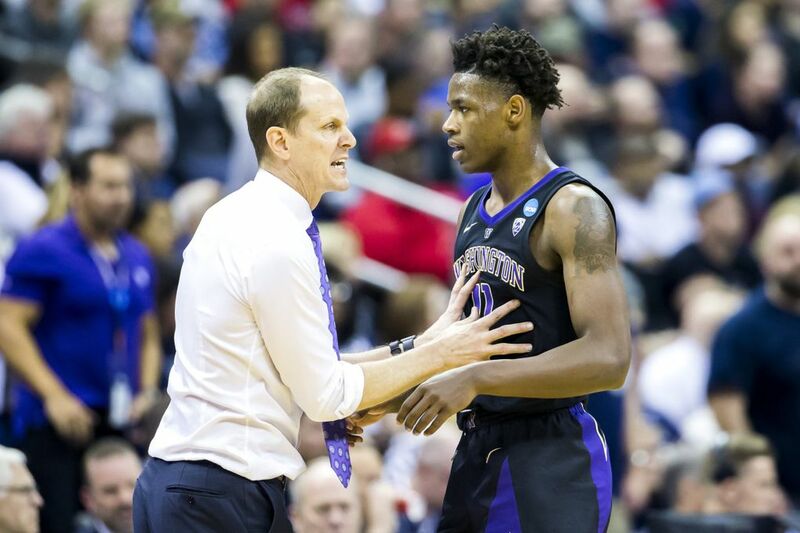 Mike Hopkins was selected as the NABC District 20 Coach of the Year while Nowell and Thybulle were chosen all-District 20 first team.